Home Brands Is a Black and Decker Coffee Maker Right for You? Rolling out of bed, you rub the sleep from your eyes, stumble into the kitchen. Ah, the glory that brought you a Black and Decker coffee maker. Actually, it was Aunt Susie last Christmas, but who cares. What matters is that you have a steaming pot of hot coffee ready and waiting for you every morning. According to the Food and Wine website, 64 percent of Americans drink coffee every day. Black and Decker has been around for more than 100 years. In 1984, they acquired the General Electric Company’s small household appliance division. For more than 35 years, the company has been making coffee makers. They have been improving their coffee makers because they want you to keep coming back for one more cup of delicious coffee. Whether it's in between work, or to give yourself a few moments to relax, you can count on a Black and Decker coffee maker. Black and Decker coffee makers are available at retailers such as Home Depot, Target, and, Walmart. You can also purchase a Black and Decker Coffee maker on their website. The price of a Black and Decker coffee maker depends on which one you buy. 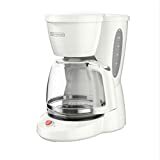 Black and Decker offers a wide variety of different models in their coffee pot line. 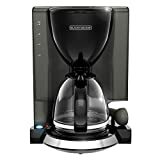 After checking out all the features, we compared pricing, warranty information, and customer reviews to bring you a comprehensive list of the best coffee makers that Black and Decker has to offer. This 12-Cup Programmable Coffeemaker comes with a soft-touch digital control panel. The programmable clock and timer include an auto-brew option and an easy-to-see “on” indicator light. With a brew-pause function, non-stick warming plate, and an automatic shut-off timer, this model has a ton of safety features. A water-level indicator, glass carafe, and removable filter basket top off the list of features included with this coffee maker. 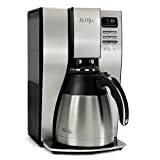 Customers gave this coffee maker a 3.1 star out of 5-star rating on the Black and Decker website, while it was given 3.4 out of 5 stars on Am​​azon. Customers raved about the water reservoir and said that it was easy to fill. They also stated that the spout on the coffee pot makes it very easy to pour coffee. Others were impressed that there is no need for warming up their coffee in the microwave with this coffee maker. Complaints about this coffee maker include the pouring spout being poorly made and that it leaked from the bottom and dripped each time they poured coffee. Auto Clean System - After 120 brews the Robusto and 20 oz. buttons will flash notifying you it is time to clean your coffeemaker. Run the Auto Clean system to keep your coffeemaker running like new! The Cafe Select Dual Brew Coffeemaker is a two-in-one machine. You can either make a single cup of coffee or brew a whole pot. Just remember, both sides of this coffeemaker don't operate simultaneously. They have to be set up and started separately. The single-serve option includes a reusable mini brew basket for easy brewing of your favorite ground Coffee. The single-serve side also uses standard K-cup pods which means that all your favorite specialty coffees are ready in a jiffy. This coffee maker lets you select up to six different single-serve options, and it has two full carafe brew settings. It is available on Amazon. This coffee maker received 3 out of 5 stars on Amazon, while it received a lower rating of 2.4 out of 5 stars on the Black and Decker website. Thirty-five percent of customers gave it 5 out of 5 stars, though. Among the comments were statements that the coffee pot works great and the brew time is short for a single serving of coffee. Some customers even claimed that this is their new favorite coffee maker. Customers leaving negative reviews stated that they didn't like that they couldn't reuse the K-cups. Some also said that this coffee maker had to be replaced by the manufacturer more than once. The 12-Cup Mill+Brew Coffee Maker lets you both mill and brew coffee with one, easy-to-use machine. Whenever you can’t wait for your coffee, the sneak-a-cup feature enables you to get a single cup of coffee without interrupting the brewing process. With this machine, you now have control over brewing strength, and a built-in auto brewing feature to save you even more time in the morning. 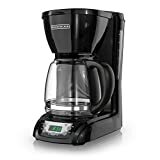 This coffee maker is available on the Black and Decker website and Amazon. This coffee maker received 3.7 out of 5 stars on Amazon. Some said it is the best coffee maker ever, while others say it is heavy but well-built. Complaints about the coffee maker leaking water seemed to rule the negative comment section. Others complained about the poor design of this coffee maker and said it was tough to clean. The Brew 'n Go Personal Coffee Maker is ideal for people that are living active, on-the-go lifestyles. This coffee maker quickly and conveniently brews a 15-ounce cup of coffee into the included stainless-steel travel mug. The travel mug fits most car cup-holders. Who doesn’t enjoy convenient one-touch operation? This coffee maker has a removable filter basket with a permanent filter that will make your morning coffee ritual a breeze. This coffee maker received 4 out of 5 stars on Amazon, with 58 percent of customers giving it the full five-star rating. It also received 3.5 out of 5 stars on the Black and Decker website. Customers raved and said they love it and that it is a great inexpensive coffee machine. Some even commented that it works better than their Mr. Coffee machines. One of the most repeated complaints about this coffee maker was that it works great and then fails after a week of use. Other complaints stated that the coffee maker is defective and that the water smelled and tasted like burnt plastic. Many were distressed that to return the coffee maker they were required to pay return shipping fees. Sneak-a-Cup Feature - This feature temporarily stops the flow of coffee so you can pour your first cup before brewing ends without making a mess. Easy-View Water Window - The side-facing window shows you the amount of water that will turn into coffee. Lighted On/Off Switch - One-touch control for easy operation, and an on/off indicator light for peace of mind. The 12-Cup Switch Coffee Maker comes with a 12-cup capacity and includes the awesome sneak-a-cup feature. You can pour your first cup of joe before brewing ends without making a mess. This is one of the most basic machines in the Black and Decker lineup. An easy view water window lets you fill the reservoir easily, while a lighted one-touch switch lets you know at a glance that the pot is on. This coffee maker is available on the Black and Decker website and Amazon. This coffee maker received 3.2 out of 5 stars on Amazon. Some customers commented that it makes a great pot of coffee while others said it is simple and easy to use. Other customers stated it has a simple design with no hassle. Almost all of the poor reviews revolved around this coffee maker’s poor design and the fact that it doesn’t work the way it is supposed to. The coffee grounds and water have spilled over the top of the water reservoir. Some customers complained that this coffee maker doesn’t have an automatic shut off. The Easy 8-Cup Coffee Maker lets you simplify your morning routine by easily brewing your choice of two, four, or even eight cups of coffee with a simple one-touch button. A removable water reservoir makes for easy filling and emptying. The unique brew basket works well with cone or basket filters, and the sleek design will look great on your countertop. This coffee maker also lets you sneak-a-cup during the brewing cycle. Customers gave this coffee maker 3.2 out of 5 stars on Amazon. Many customers said they like this machine because the eight-cup option keeps their coffee warmer for a longer period. Others stated that the filters are versatile and that the coffee maker is a great deal. The most common complaint was that more than one person said it stopped working after only a few months of use. Other customers warned people not to buy it because it isn’t worth the money. Overall, Black and Decker compared well with other brands of coffee makers. These include Cuisinart, Mr. Coffee, and Hamilton Beach coffee makers. The Cuisinart PerfecTemp Programmable Coffeemaker is like the Black and Decker 12-Cup Programmable Coffee Maker. This system allows you to select regular or bold brew cycles. This coffee maker is packed with features like automatic 24-hour programmability, an auto shut off, and the coolest feature of all -- it’s self-cleaning. An adjustable keep-warm temperature control adjusts the warming plate temperature to low, medium, or high. This feature keeps freshly brewed coffee at the temperature you prefer. Customers gave this coffee maker a high rating of 4.1 out of 5 stars on Amazon. Some customers commented that it is easy to use and that it is a nice unit. Others said it made getting coffee even easier for them in the morning and that it makes great tasting coffee. Customers repeatedly complained that after a few months, the coffee maker stopped working correctly and that the finish on the black warming plate was flaking off. Others said they didn’t like that they had to pay for return shipping of a defective product. 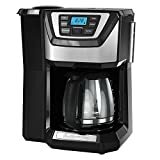 The Mr. Coffee 10-Cup Thermal Coffee Maker comes with some of the same features as many of the Black and Decker coffee makers, including a removable water reservoir. There is also the grab-a-cup option which is similar to the Black and Decker coffee maker sneak-a-cup feature. The water filtration system helps remove up to 97 percent of chlorine for better tasting coffee, and the stainless-steel thermal carafe keeps coffee hot. This coffee maker is comparably priced on eBay if you buy it brand new. This coffee maker received high ratings of 4.8 out of 5 stars on eBay, while on Amazon it received lower ratings of 3.7 out of 5.0 stars. This coffee maker’s constant buzzing noise while in use was one of the top complaints. Others stated that the thermos didn’t last more than two months and that it leaks. 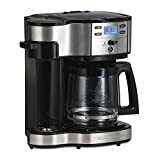 The Single Serve Coffee Maker from Hamilton Beach is packed with features such as an auto-shutoff option, and a brew strength function which allows you to easily make bold or regular coffee. It has a single-serve mode or a full pot mode just like the Cafe Select Dual Brew Coffeemaker from Black and Decker. Prices range from $50 to $65. It is available on Amazon. This coffee maker received a high rating of 4.2 out of 5.0 stars on Amazon with 67 percent of customers giving it a full five-star rating. Customers love that it has options for both a single cup and a full pot of coffee. Others also claimed it was easy to set up and easy to use. One of the most complained about aspects of this coffee maker is that the glass carafe broke after the first use. Some customers also said there usually are more than two cups of coffee left in the holding tank, that won’t drain for cleaning. Others commented that the coffee tasted like plastic. Our first choice for a Black and Decker coffee maker would be the Brew 'n Go Personal Coffee Maker. 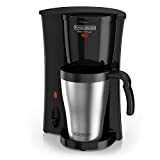 If you have an active lifestyle, this is a great Black and Decker coffee maker because it brews coffee quickly. It has excellent features and is inexpensive. 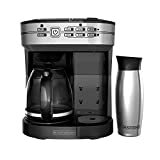 Our runner-up choice of a Black and Decker coffee maker is the 12-Cup Switch Coffee Maker. We chose this one because it allows you to get a cup of coffee without stopping the brewing process with its sneak-a-cup feature. It is also an inexpensive option for those that are on a budget. If you have had experience using Black and Decker coffee makers, let us know in the comments section.